It truly does take a village. King’s “village” always steps up to the plate to help people in our community. 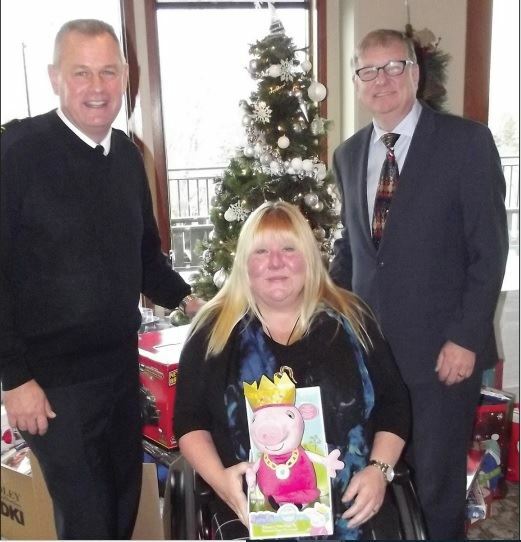 Local generosity was on display at the annual Chamber of Commerce Christmas Lunch, in aid of the Nobleton Christmas Drive. A small mountain of toys were collected from Chamber members, which were collected and delivered by members of King Fire & Emergency Services. “There is a Santa Claus, and her name is Mary,” said Chamber president Tom Allen. He was referring to Mary “Mimi” Buchanan/Lyons, who’s headed up the drive for the past 23 years. King Fire Chief Jim Wall said the drive actually runs all year long, providing toys and money to families. The toys are given to kids so they can bring a gift to a friend’s birthday party. During Grade 8 graduation, some students are outfitted with the perfect attire to attend their celebrations. The need, Wall pointed out, is ever-present, and the team at Nobleton Public School help lead the charge. He said KFES has been proud supporters of the drive for the past seven years. This year, the drive is supporting roughly 25 families, almost double the number from last year. He pointed out people can give in many ways, not the least of which are time and respect. “We’re proud to be part of this,” he said. 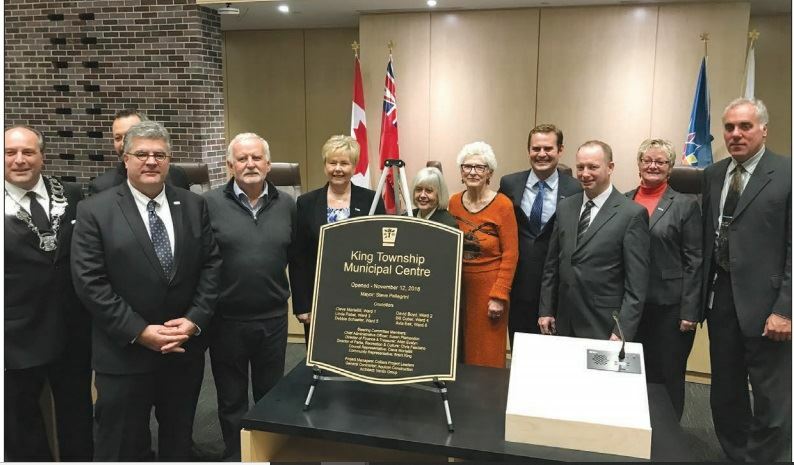 Bursting with pride, King Township councillors and staff dedicated the new municipal complex Nov. 12. The spacious, modern building is the epitome of efficiency and a testament to King’s pride of ownership. “It’s not every day you get to dedicate a building like this,” remarked Mayor Steve Pellegrini. “It’s hard to believe that more than two years ago it was nothing more than a set of blueprints and a couple of artist renderings. “The building itself is a beautiful mix of brick and wood in keeping with the rural nature of King Township. “Along with the bricks and wood we’ve also put in many sustainability features, including a geo-thermal loop and electric vehicle charging stations. We’ve already started to work on landscaping and reforestation of the property to make the environmental footprint even greener than it was. There is a multi-use gymnasium with a fantastic sprung wood floor. It will eventually be used by members of the community. Pellegrini noted that combined with the York Regional Police substation, it makes this a community hub instead of just an office building. “I’d like to congratulate my council colleagues on having the courage and vision to go forward with such a large project. There were a lot of people responsible for getting us from where we were to where we are today, including our CAO, Susan Plamondon, who was the driving force behind the vision for thenew centre. “I’d like to thank our staff. They had been in that old, very tired location for many years and they spent many hours getting ready for this move. I see many smiles around as I walk through the halls of this building. “Chris Fasciano, our director of Parks, Recreation and Culture, served as the primary liaison between the administration and the project manager, architect and the contractors who eventually built the building. I don’t think even Chris could total up the hours he spent taking care of issues small and large, many at the last moment, to ensure the doors opened on time. “I’d like to thank our staff. They had been in that old, very tired location for many years and they spent many hours getting ready for this move. I see many smiles around as I walk through the halls of this building. “Chris Fasciano, our director of Parks, Recreation and Culture, served as the primary liaison between the administration and the project manager, architect and the contractors who eventually built the building. I don’t think even Chris could total up the hours he spent taking care of issues small and large, many at the last moment, to ensure the doors opened on time. “Jennifer Caietta and her team have been working very hard in the background over these last months to develop a program that we have been able to initiate from day one,” the mayor said. The facilities team has been “unbelievable in making the move happen.” The mayor lauded Barbara Harris, manager of Information Technology, and her team who put in some very long hours to make sure the phones and information network were up and running the first day. The mayor also singled out Councillor Cleve Mortelliti and Brent King, a resident, who sat on the committee that provided oversight of the project. Two new faces will join re-elected incumbents on King council for the coming term. Two races saw the winners emerge with slim, 56-vote margins. In a surprising upset in Ward 1, newcomer Jordan Alexander Cescolini edged out veteran Cleve Mortelliti by 56 votes, in a 589-533 victory. Kelly Colasanti finished third with 151 votes. Cescolini garnered 46.27% of the vote. Jakob Schneider is the new Ward 3 councillor, admitting he has some big shoes to fill, following in the footsteps of veteran councillor Linda Pabst. “The real challenge is to fill those shoes,” he said. Schneider edged out Geoff Simpson 279-223, in an extremely close race. They were separated by only 56 votes. He admitted he welcomes a bit of a rest from the tiring campaign and then it’s time to “get down to business.” He is absolutely pleased and couldn’t have asked for anything better. Debbie Schaefer was re-elected in Ward 5, noting the constituents were very lucky to have had great candidates. She defeated Rob Payne 573-497. He called to congratulate her and give her the results over the phone on Monday night. She called him a very gracious and commendable opponent. Sasha Mozaffari finished a distant third with 32 votes. While exhilarated, Schaefer said she was somewhat disheartened by the turnout. Of some 3,500 eligible voters in Ward 5, only 1,102 came out to vote. “I’m feeling badly for democracy,” she said. That being said, there’s plenty to do in the next term. During the campaign, Schaefer took copious notes from the feedback she received at the doors. She will be reviewing those notes and bringing resident concerns to the forefront. Avia Eek continues to make history. As the first female Ward 6 councillor, Eek was re-elected for a third term, overpowering Roman Dyriw 262-122. She earned 68.23% of the vote, but noted the number of votes was down from the 2014 election. She would have liked to have seen a better turnout. “I’m happy I get to continue to work for the community,” she said. since 1996. He vows to work as hard over the next four years as he did in his first term. Bill Cober has been returned as Ward 4 councillor, defeating Mary Asselstine 879-572, for 60.58% of the vote. Ward 4 had the highest voter turnout in all of King and Cober credits that to the caliber of candidates and the way he and Asselstine engaged the community. The work by both candidates created a “great community consultation,” and Cober is pleased to continue his work as councillor. Bob McRoberts won his trustee seat on the York Region District School Board, easily defeating his opponents. McRoberts collected 2,118 votes, or 64.49% of the vote. Peter Adams-Luchowski was second with 688, followed by Ken Turriff with 478. Elizabeth Crowe was re-elected as trustee on the York Catholic District School Board, earning 987 votes, or 63.39% of the vote. Her closest opponent was Laura Ronco with 354 votes, followed by Paul de Roos with 216. Job creation and easing local traffic woes were top of the list at the first municipal all-candidates debate last week. The King Chamber of Commerce brought together all 14 council candidates Oct. 3 at Nobleton Lakes. 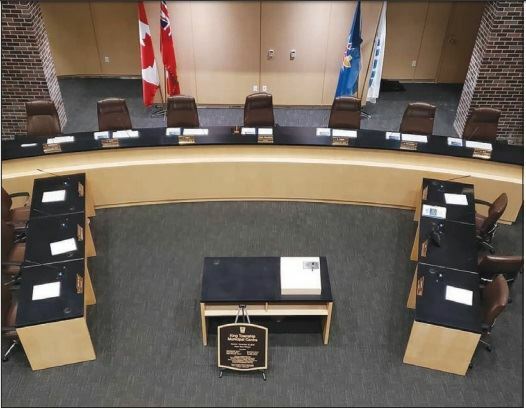 Candidates in Ward 5 received the most attention from residents, who put the would-be councillors in the hot seat with their questions. MC and Chamber board member Jay Rider asked the candidates how best to address the jobs deficit in King, and foster economic development. Ward 6 candidate Roman Dyriw said he’s a big proponent of the small stores and shops that are common in villages. Incumbent Avia Eek said King’s Economic Development Strategy has set out tasks and goals and council is proceeding with them. She is also keeping her eye on a business corridor in her ward, that runs up Highway 11 to Bradford. Ward 5 candidate Sasha Mozaffari said when Magna International builds its headquarters on the parcel at the corner of King Road and Jane, it will bring jobs to the community. She’s in favour of asking residents what they would like to see in terms of job creation. Rob Payne said the bulk of King’s industrial/commercial development is limited to Schomberg and it’s not enough. Some 87% of the tax burden falls on residential homeowners and we have to consider enlarging commercial areas in all the hamlets. As well, council should be cognizant of the 1,000-plus home-based businesses as well as the agricultural operations. Incumbent Debbie Schaefer said our towns need to be attractive to investors and we have to leverage King’s unique qualities. Improving broadband is just one area that will make King more suited to businesses. Ward 4 candidate Mary Asselstine said the revitalization of Schomberg’s Main Street is under way and hopes are it will become more attractive to retailers and fill up. The industrial area near the Trisan Centre is still largely vacant and King needs to really look at light industrial uses that bring jobs. Incumbent Bill Cober said over the past 10 years, there have been significant gains in job creation. Council has worked with Showa, a major company in Schomberg, to help them improve their efficiencies. He stressed the Township has to make sure we have the amenities in place to attract investment. Ward 3 candidate Jakob Schneider said his ward is largely rural, so it’s quite different than King’s other urban centres. The Township, he said, needs to more fully promote agricultural and equestrian operations and cut some of the red tape to foster growth in those areas. Geoff Simpson said he’s on deck to do whatever is necessary to support King’s farmers and equestrian operators. The ED study does have measures laid out, so King will have to concentrate on moving them along. Ward 2 candidate Sherry Draisey said increasing transit connectivity in all areas of King will draw businesses. Incumbent David Boyd said King’s infrastructure improvements, transportation master plan and improved Internet services all make King investment-ready. New and existing businesses need these in place. He also said the Township’s CIP program make our core areas more attractive to new businesses. It’s working well in Nobleton and he’s excited to embark on new measures, especially promoting eco-tourism. Ward 1 candidate Kelly Colasanti said King has to increase its industrial/commercial inventory and expand boutique retail. Infrastructure and enhanced GO service will also help. Jordan Cescolini, as a small business owner, said we have to take a step forward to attract industry. Tough decisions may have to be made and it’s time to talk realistically about merging the old and new villages. Increasing the industrial/commercial ratio will help lower taxes. Incumbent Cleve Mortelliti said King has helped foster the repurposing of older buildings for new businesses. As well, the municipality does have plenty of serviced industrial land, but it seems to be in areas no one wants. There’s no concensus among residents as to the preferred solutions. He knows residents want tax relief and it’s a constant balancing act. The topic of a bypass for King City led to a lively debate, but saw little in the way of concrete solutions. Mortelliti said an Environmental Assessment was done on several options, pointing to the 15th Sideroad as the only viable option. But York halted studies and the 15th has been pulled off the table. He said we won’t see any real solution or bypass options in the next three terms of council. Cescolini said traffic is a major concern in King City, and for residents along the 15th. King has to “get the ball rolling” to study traffic relief options. a bypass route, noting it’s the most logical. He added we have to get trucks off of King Road, too. Payne said he was surprised to hear that support for the 15th, stressing it’s not a viable option. He wouldn’t waste taxpayers’ dollars to reopen this debate. Mozaffari said a new study is the best bet to look at traffic, especially as King City grows. Schaefer said a bypass through Kingscross would carry an “astronomical cost,” and it’s not even clear it would solve the problem. The King-Vaughan Road is likely more of an alternative. Ward 5 candidates were asked about the parking situation at the King City GO station, and what can be done to provide more spaces. Schaefer said Metrolinx has said it will expand the parking, but hasn’t committed to a time frame. More YRT service to the station would help. There is ample parking in the village, and people need to know about the availability and just walk a couple of blocks. Mozaffari said expanding the parking lots and extra bus service is needed in the village. Payne noted the GO lot is at 100% capacity and will reach 160% over the next couple of years. King has to push Metrolinx to expand the parking. The Green P lot is underutilized so perhaps a shuttle bus from there would be a good idea. Opening remarks The candidates were given the opportunity to introduce themselves and their platforms in their opening remarks. For some, this was their very first public debate. Chamber President Tom Allen said this debate is “democracy in action,” and he said it’s so very important that voters have options in every ward. 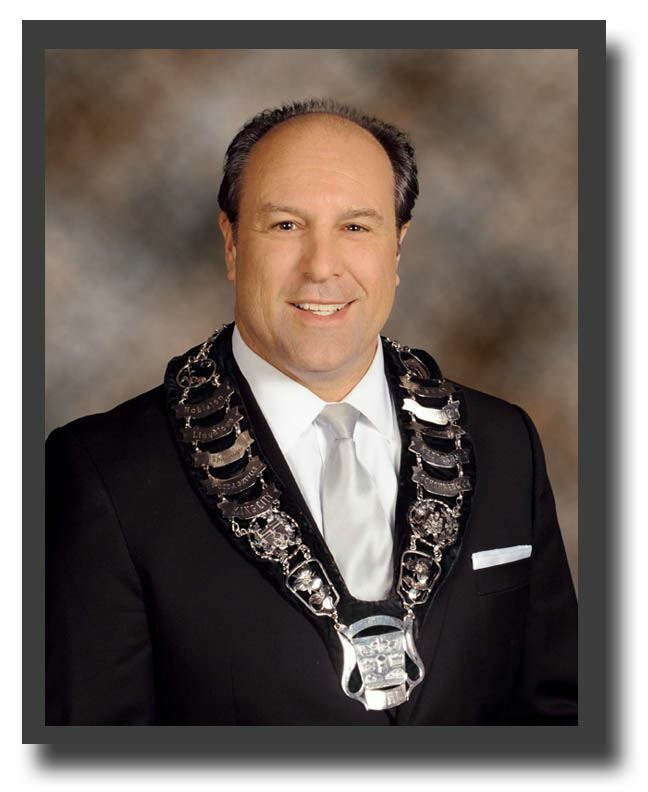 He praised the candidates for “putting yourself in the public eye.” Mayor Steve Pellegrini, acclaimed for the second time in a row, thanked the Chamber for hosting the debate. “I humbled by my acclamation,” he said. “I’d like to say thanks to the amazing people of King who have shown confidence in my leadership over the last eight years. “I promise to continue working hard for the next four years to encourage economic growth, increase broadband, improve our roads and improve the quality of life for our residents and businesses. “We’ve accomplished a lot over the last four years. With all the positive changes that have been happening recently, it’s nice to know King is starting to be recognized as one of the best places in Canada to live. MoneySense magazine recently released its annual survey of the best places to live in Canada and King ranked first in York Region, eighth in Ontario and 18th in Canada. The survey ranked cities based on criteria like wealth and economy, population growth and taxes.” Cescolini, 22, said the changes he’s seen in the past few years make him want to build a better future. He’s pushing for a lower tax rate, growing the tax base and improving infrastructure. He said he’s big on listening to the people, and making sure their voices are heard. Colasanti, a five-year King City resident, wants to give back to his community. He’d like to see King City become a destination to shop and he’s supporting improving the maintenance of vacant lands in the area. He’s also pushing for lower taxes and dealing with traffic congestion in the village. Mortelliti said he has 12 years of experience at the council table, which is both valuable and useful to residents. The self-professed problem-solver is well versed in municipal politics as well as civil engineering, giving him a thorough understanding of issues and the process. Draisey said her focus is on pedestrian protection in Ward 2. She’d like to see improvements to pedestrian walkability in Laskay. She’d also like to see better scheduled road construction to avoid drawn-out periods. Reducing traffic is key to maintaining King’s property values. Boyd noted he has long roots in the community and he’s in office because he cares. He wants all King residents to feel “at home” in their own community. He’s compelled to serve as councillor, ensuring the community remains the place to be for future generations. Schneider, a 4th generation farmer, said he’s attended 65% of the council meetings over the past term to acquaint himself with the process and issues. In listening to residents, he found road safety, cell phone service and infrastructure improvements are top of the list. We need to make King more business friendly, he said, noting we must promote our agri-businesses. He’s also a big supporter of accessible and affordable housing. Simpson, a 12-year Schomberg resident, said he brings his business and some 50 years of cumulative volunteering to the table. He thrives on finding solutions. In his many leadership roles and committee involvement, he’s developed great listening skils. The role of councillor would be his top priority. Asselstine, a Schomberg resident and volunteer since 1985, has learned the importance of “looking after each other.” She’s invested her time in her community, making many partnerships. Realizing the pressures on King, she said it’s important we establish a collaborative approach to what’s needed for the community. Her skills, energy and passion will be ideal as a fulltime councillor. Cober has enjoyed serving his constituents and as a “home-town product,” he’s happy to continue in this role. Fostering relationships with residents, groups and Township staff will help meet the challenges ahead. He supports promoting and cultivating King for future investment through economic development measures, and working with other levels of government. Tackling gridlock, improving infrastructure are top of the list for Mozaffari. Members and supporters of the King Chamber of Commerce raised a glass to cheer some milestone accomplishments last week. Local businesses and their contributions to the community were front-and centre during the annual Excellence in Business Awards dinner, held at Nobleton Lakes. The awards took on a special meaning as the Chamber marks its 10th anniversary. Board member and MC Jay Rider said the partnerships built by the Chamber, particularly the solid relationship with King Township and Economic Development Officer Jamie Smyth, are “gratifying and special.” Of course, the bread and butter of the Chamber is the local small business community. Chamber president Tom Allen thanked the corporate sponsors who are all “extremely important” to the group’s sustainability. He handed out plaques recognizing John’s No Frills, Nobleton Lakes, York Energy, Priestly Demolition, Seneca College, King Weekly Sentinel, Seasons Floral, Tree Frog, Foley Restoration and KARS. “We’re 10!” Allen exclaimed. He pointed out the Chamber has evolved to include a cohesive board with representation across the township. The Chamber has been an advocate and lobbyist for business interests and continues to have a voice. Allen introduced the sponsors and award winners. Tree Frog’s Sarid Layton presented the Holland Marsh Wineries with the Excellence in Small Business Award (1-10 employees) for their community support. Roland Nersisyan purchased the land in 2007 and shortly after planted their first 6 acres of vines (as it takes approximately 2-3 years before they start producing sufficient fruit). The winery officially opened to the public in December of 2010 and sold their first bottle of wine. Roland Nersisyan is a third generation winemaker and it took a considerable amount of time before he found the perfect piece of land to establish this proudly Canadian vineyard and eventually produce wines that showcase cold hearty varietals that thrive in our cool climate. After coming across this unique piece of land that is the tip of the Holland Marsh (containing a unique mixture of clay and sand), it proved to be the perfect site to establish this “off the beaten path” vineyard. Nersisyan’s hope that maybe one day they may influence future winemakers to take a leap of faith in establishing vineyards in areas that are not yet discovered for their viticultural excellence and develop this industry in our communities to elevate Canadian wines to the world class level they feel it deserves to be at. Candidates vying to be the first MPP for King-Vaughan engaged in back-to-back discussions at two local events. 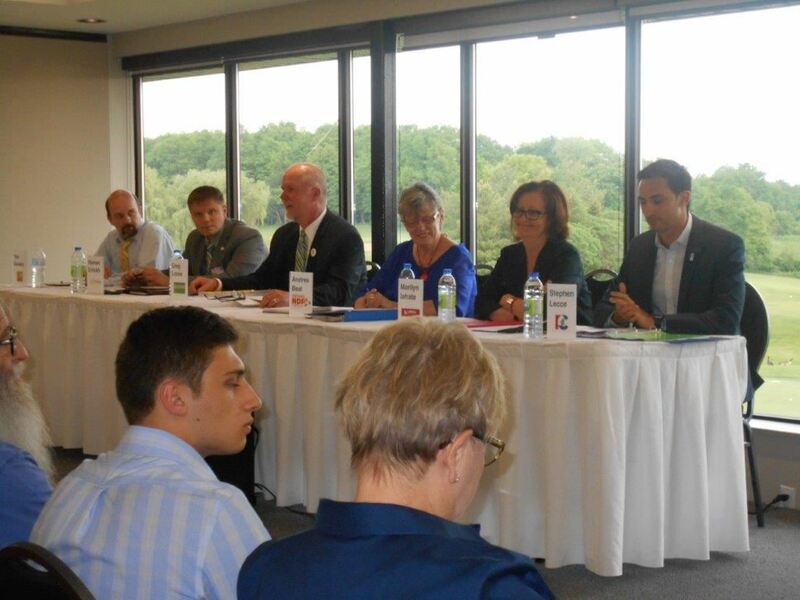 The six candidates in King-Vaughan came together, thanks to the efforts of the King Chamber of Commerce and Concerned Citizens of King Township. These were informative, cordial discussions, with all candidates expressing a genuine commitment for constituents. Tom Allen, Chamber president, said these candidates deserve credit for their willingness to serve and putting themselves out there. They offer choices and such a choice makes our democracy stronger. The Conservatives vow to give business a competitive advantage, and make Ontario a destination for foreign investment. The main areas of focus of the Conservative platform are to scrap the carbon tax; reduce hydro rates by 12%; create long-term care beds and up funding for mental health. New Democrat Andrea Beal, a retired teacher and guidance counsellor, said she’s been successful in her years of advocacy through decisions by concensus. The NDP this time, have a great platform, that includes increasing pharmacare and dental care; reducing hydro rates by 30%; putting Hydro One back in public hands; ending “hallway medicine” and increasing day care subsidies. Revenue for these plans will come from the wealthy, who will be on the receiving end of higher income taxes. Green Party candidate Greg Locke has worn many hats in the King community and has always been a champion of building sustainable communities. He admitted he’s a bit of an underdog in this election, but perhaps it’s time for such a change. Trillium Party candidate Roman Evtukh said his party has experienced tremendous growth since 2014 and while they’re not mainstream just yet, their membership is made up of many former PCs. The party’s guiding principles are founded in all constituents having a say in policy decisions. I want change,” he said, noting Ontario is the most heavily regulated jurisdiction in North America. He questioned the need for such “cradle to grave” legislation. Libertarians favour less government and more non-government options, along with repealing many restrictive regulations. Each party offered their solutions to the suffocating electricity rates in this province. heating or eating. Hydro rates, he said, have risen 300% over the term of the McGuinty-Wynne Liberals. They’re “shockingly high” and the Conservatives have an achievable plan to reduce rates by 12%, saving the average family $174 per year. Iafrate said the Liberals have already reduced rates by 25% but we’re faced with a hydro infrastructure that’s in shambles. It has to be maintained and money has to be spent to bring it up to par. She admitted the Province “needs to do better” and she said she’s not opposed to hydro privatization. Beal said the NDP vow to reduce rates by 30% and put Hydro One back into public hands. They are intent on making life more affordable through many measures, including dental care and pharmacare for everyone. Locke said the Greens have a developed platform, that includes buying cheap, abundant power from Quebec. They recommend closing the Pickering nuclear plant, saving an estimated $1 billion per year. Conversely, Evtukh said nuclear power is clean and cheap. The government, he pointed out, has been wasting money on ineffi cient green energy and they would repeal the Green Energy Act. Simkin said the Libertarians, too, would repeal the Act. They would reopen contracts and remove many government appointees to various boards. As of March 31, 2018, the Ontario government’s total debt is projected to be $348.79 billion. The debt-to-GDP ratio for 2017-2018 is 37.1% and interest on the debt is $11.97 billion, representing 8% of Ontario’s revenue and its fourth-largest spending area. Ontario’s debt has to be paid and the defi cit is a real burden. The candidates were asked how their party would deal with Ontario’s massive debt. We can’t continue to borrow, Simkin observed, noting we have to look at cheaper power options and get rid of old options that have proven ineffective. We can’t solve the debt with a onesize-fits-all approach. Evtukh said eliminating the carbon tax will boost the economy and that will increase revenues. Trillium would also review the minimum wage to see if it’s negatively impacting business. The Green Party is “fiscally conservative,” Locke said and “socially progressive.” They have a fully costed program that balances the books by concentrating on people, jobs and the planet. Beal said the NDP also has a costed plan but will run a “small defi cit” over the first two to three years. They hope to achieve savings through closing tax loopholes and ask the wealthy to pay more in taxes. They also plan a surcharge on luxury vehicles. Iafrate said Ontario has enjoyed the highest economic growth under the Liberals and they admit they’ll continue running deficits over the next term. With some key initiatives, the deficit will come to an end. Lecce pointed out we all have to live within our means, and so should the government. The Liberals, he pointed out, have doubled the debt from 2003 to 2018 and Ontario is the most indebted jurisdiction in the world. We spend more on the deficit than we contribute to hospitals in this province and we need fiscal responsibility. Municipal governments provide essential services but they’re stretching tax dollars to deliver those services. How do the parties plan to help municipalities?
. “I will fight every day, for every single dollar that flows into this community,” he vowed. As a municipal councillor, Iafrate said she knows the burdens faced by local government. the Liberals have committed to improvements to both Highway 400 and Highway 427 and they will continue to promote employment lands locally, to bolster the economy. Beal said there has been a historic downloading from Queen’s Park and the NDP would upload more responsibilities back to the province. Working more closely with the municipalities and funding transit options will help locally. Locke said municipalities should be given more money and more control over local planning. The Trillium Party is fiscally responsible and they would cap tax increases to the rate of inflation. They would encourage more business investment and help municipalities develop vacant employment lands. More investment in infrastructure and transit are key. Simkin said the problem with key infrastructure projects in Ontario is they’re always behind schedule and too costly. Libertarians would delegate some responsibilities to the municipalities and de-monopolize the MTO. “There’s plenty of room to think outside the box,” he said. Simkin pointed out that every year, some 26,000 Ontarians leave the province for out-of-country health care. If we need to pay for care, we should be spending those dollars here and more private options should be encouraged. In health care, Simkin said roughly half of the budget gets to front-line services, while the other half is eaten up by adminstration. Evtukh, a paramedic working in Peel, said health care has been mismanaged and the LHINs have added unnecessary layers to the bureaucracy, leading to too much waste. We need to spend more on primary care, he said. Locke said the Greens would expand OHIP-plus, expand dental and pharmacare, to put people first. Beal said the NDP health plan includes increased funding to hospitals and increased money to capital expansions. They vow to add 2,000 more hospital beds and end surgeon salary caps on surgeries. Iafrate said the new Mackenzie Hospital in Vaughan will dramatically help residents in the riding. Lecce stressed health care is “at a breaking point” and the Conservatives have a plan to decrease bureaucracies and increase long-term care beds. They also vow to boost funding for autism programs and preserve OHIP-plus. King Township is committed to helping businesses succeed. That’s the mantra followed by Township politicians and staff, when it comes to assisting the King Chamber of Commerce, and all businesses in this municipality. Mayor Steve Pellegrini and Chamber president Tom Allen both said there’s a true collaborative effort between the two organizations. A full house attended to hear all of the exciting news in King, at the annual Mayor’s Lunch. Mayor Pellegrini highlighted some interesting facts about this township. King consists of 333 square kilometres, including 100 kilometres of trails and 90 hectares of parks. King is home to roughly 24,512 people in 8,736 dwellings. More than half of the Holland Marsh (60%) is in King. The average household income in King is an impressive $175,616. The business side of King is equally impressive, with more than 500 businesses based in King. The bulk (70%) are service related and the remaining 30% are goods producing. King’s jewel of community planning is its Sustainability Plan, which has been in place since 2012. Developed through extensive public collaboration, it creates guiding principles for protecting the environment; working with the rural community; providing transportation options; cultivating a sense of community; making smart planning decisions and encourages long-term financial decision-making. King has evolved in leaps and bounds over the past two years (2016-2017) and the accomplishments have been numerous. And this year is shaping up to be an exciting one, too. Currently, the Township is encouraging residents to participate in the Core Areas Parking Study, which was launched in order to better understand existing parking challenges in the village cores of King City, Nobleton and Schomberg. By visiting caparkingstudy.king.ca, people can take a short survey and pin comments on a crowdsourcing map. A $1 million contribution by York Region will help spark streetscaping improvements in Nobleton this summer. The partnership between the region and Township will see improvements to sidewalks, new benches, plantings, signage and more. Two massive projects are currently unfolding in King. The new municipal building on King Road is taking shape. The total estimated cost of the project is $21.5 million that will be fi nanced using infrastructure and development charge reserves; the proceeds of the sale of the current property at 2075 King Rd. and debenture. York Regional Police will also make a capital contribution and sign a lease for its space. There are many ways the new building will benefit the residents of King. The entire new space has been designed to provide a central customer service kiosk where residents will be able to have most of their Township-related business taken care of in one spot. There will also be a new public use gymnasium/event space and a larger council chamber which will better serve the overflow audiences currently experienced at council meetings. Residents will also benefit from the addition of a York Regional Police substation that will be part of the new building. Also the maintenance and operating expenses will be less. King Township has sold its current municipal office and strip plaza for almost $11 million. The sale price will cover the lion’s share of the estimated $13 million price tag to build the new municipal complex. King will also receive $1.5 million from development charges, and York Regional Police will pitch in another $1 million. The new YRP substation will be “huge for us,” the mayor stated, adding it will improve response times and create a permanent police presence in King. King’s planned multi-faceted recreation complex will be a model, and the envy of all other York municipalities. This model of cooperation resulted in an innovative agreement between King Township and Seneca College. The deal sees Seneca providing a 25-acre parcel on its lands at the northwest corner of Dufferin and the 15th Sideroad, on a 60- year ground lease. King will build and operate the facility. King’s Parks, Recreation & Culture department is in the initial stages of planning and designing the complex and it’s looking for public feedback into what residents would like to see. The mayor noted that some $15 million has been promised by local developers for this project. After engaging in an extensive process of consultation with King businesses and collaboration with Township Staff, the King Chamber of Commerce is very pleased to see its efforts culminate with Council's decision on January 23, 2018 to approve the proposed amendments to King's Sign By-Law. These amendments modernize the Sign By-Law, ensure both flexibility and consistency, and provide an environment where King businesses will be able to visibly yet tastefully showcase their offerings. A special thanks goes to Tom Allen (Pres.) and to Board members Andy Nemes, Kelly Foley and Jay Rider who worked diligently throughout 2017 to ensure that the concerns local businesses were heard and communicated to Staff and Council. We also thank Township Staff, in particular Jamie Smyth, Economic Development Officer, both Kathryn Moyle and Nancy Cronsberry from the Clerk's Office, for working collaboratively and constructively with the Chamber to ensure that the most prevalent concerns of local businesses were addressed in the modernized Sign By-Law.